Well, there wasn't supposed to be a Part II. At least I wasn't expecting there would be a need for one, as I thought we were done buying during Antiques Week. But I was mistaken, as it turns out. 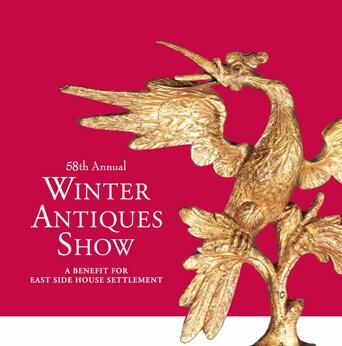 On Wednesday, Boy and his assistant designer, Nancie Peterson, did some shopping for clients on Lexingon Avenue and then combed the aisles of the Winter Antiques Show. 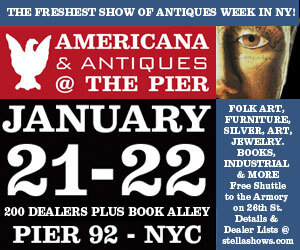 As I have written before, the Winter Antiques Show is the Granddaddy of the New York antiques shows. I believe it is the most prestigious and vaunted antiques show in America, in league with the top European fine arts and antiques shows. The Winter Show, as it is known here in New York, is the longest running antiques show in the city, and its opening party is one of the major events of the New York social season. Boy vowed that our personal shopping during the shows and auctions was complete. 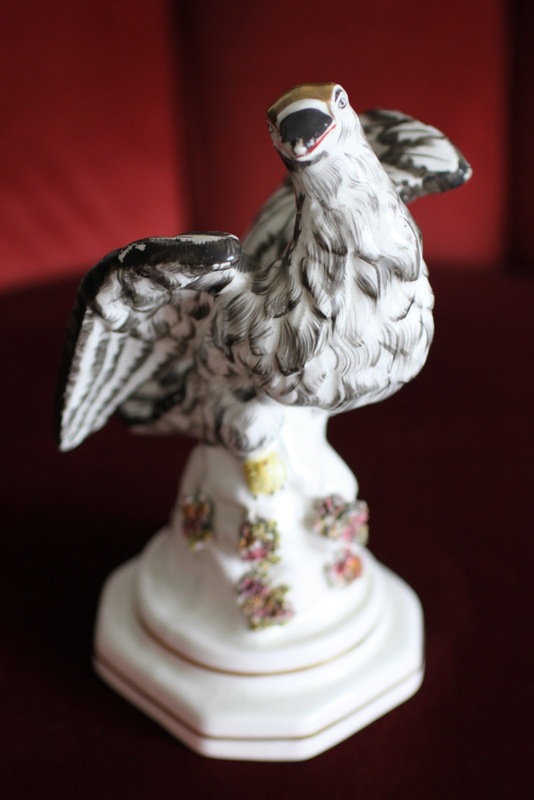 However, when trolling one aisle of the Winter Show he spotted this 7½ inch tall Staffordshire eagle, circa 1835, tucked in a corner cupboard at the booth of Jeffrey Tillou Antiques. Boy said, "I think I might need that." He looked at Nancie for her opinion, and she, knowing our house and its collections, nodded, "Yes, I believe you do!" 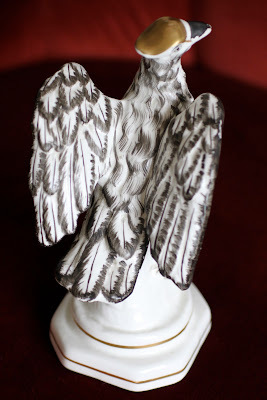 The figures's feathers are sublime. And the bits of flora bocage on its perch are quite divine. Here, the bird is straining to fly from our Manhattan apartment's window and soar to Darlington House, where it will join our collection of English Staffordshire figures and animals. Since the Winter Show officially closed yesterday evening, and was the last event of Antiques Week to do so, I am now confident to say—with a mixture of pleasure and relief—that we really are now done with the shows this season. 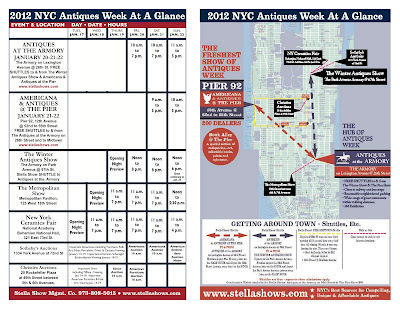 The invaluable "NYC Antiques Week At A Glance"
This year was not a big buying year for us, and from the looks of things and what we heard from others out and about during Antiques Week, we were not alone. Our own reasons for increased selectivity, if not parsimony, this Antiques Week were due to several factors. The first was the frank acknowledgment that Darlington House is, in fact, already packed to the gills, with every one of its shelves, tables, walls, closets, and cupboards jammed with objects, china, paintings, and more. There simply isn't much—if any—room left for any more stuff. The second reason is our household's increasingly conservative financial outlook due to the unsettling—and continuing—volatility and uncertainties of the global financial markets. We've been clamping down lately on unnecessary expenditures beyond housing, transportation, and sustenance, and limiting what extraneous purchases we do make to "little-ticket" items. 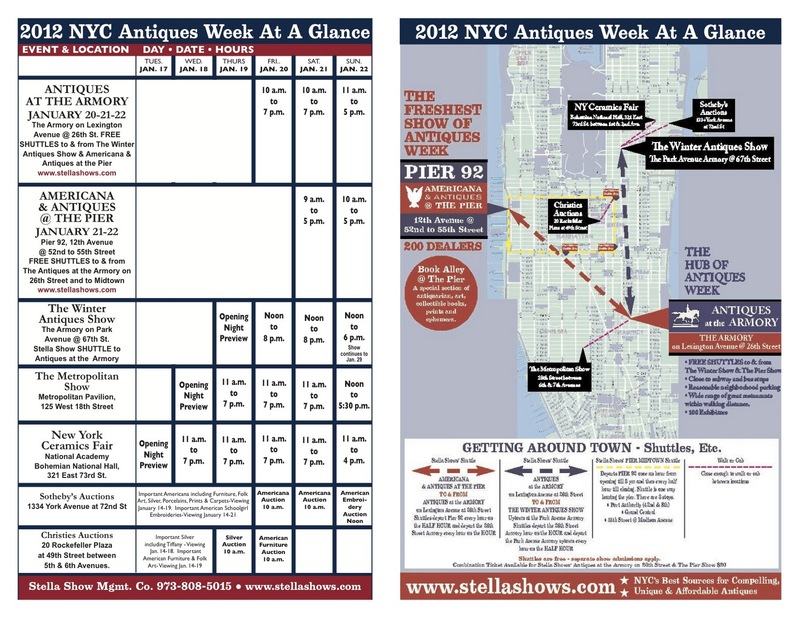 But Antiques Week in New York is something that is not to be missed for us, and attending the shows is a professional requirement for Boy because, as a high-tone New York City decorator, he must always be on the lookout for his clients' needs. That being said, we approached the shows this year with the mandate to keep our personal pocketbooks firmly clasped (as I also vowed to do last year, albeit ultimately unsuccessfully, as I related in an earlier essay), and only to pry them open if confronted with what we both immediately agreed was an absolute "must have"—defined as being something we already collected (i.e., no new ground to be broken here) and where the failure to add the object to our collection would be considered a loss, once the opportunity had passed us by. Oh, and any contender had to be exceedingly well priced. On Friday morning, at the Antiques at the Armory show (also known as the downtown Armory show to distinguish it from the far more expensive uptown Winter Antiques Show at the Seventh Regiment's Armory on Park Avenue), Boy spotted a pair of black basalt campagna-form urns at the booth of Mad River Antiques, of North Granby, Connecticut, moments after the doors to the show opened. 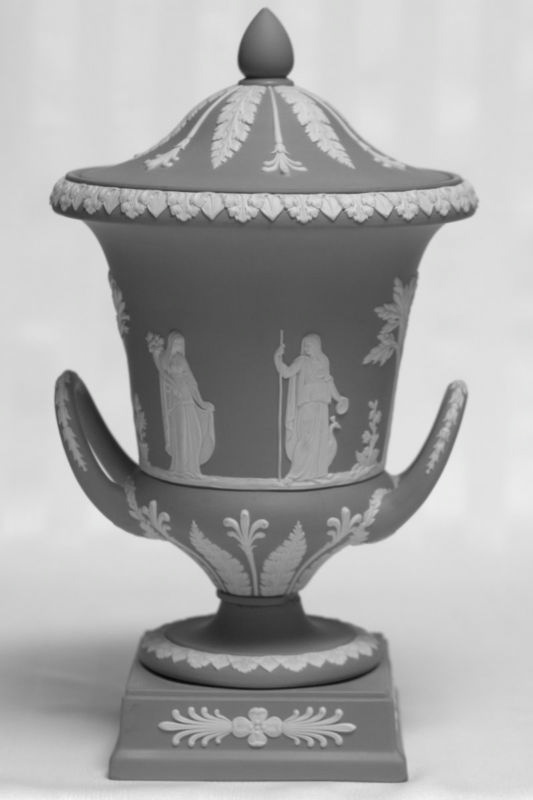 Standing ten inches tall and decorated with Arcadian figures in classical dress, the urns are stamped WEDGWOOD and ETRURIA, and also with the letter P. Based on these identifying marks we determined that the urns were made prior to 1891, when the word ENGLAND was first added to the Wedgwood mark. We further pinpointed the exact year they were made as being either 1861 or 1887, the only two years that Wedgwood used the letter P to identify when a particular piece of pottery was produced. ETRURIA refers to Wedgwood's pottery factories in Staffordshire, England—the Etruria Works—where the urns were made. The Etruria Works opened in 1769 and closed in 1950. The basalt urns Boy acquired are missing the lids that originally surmounted them. 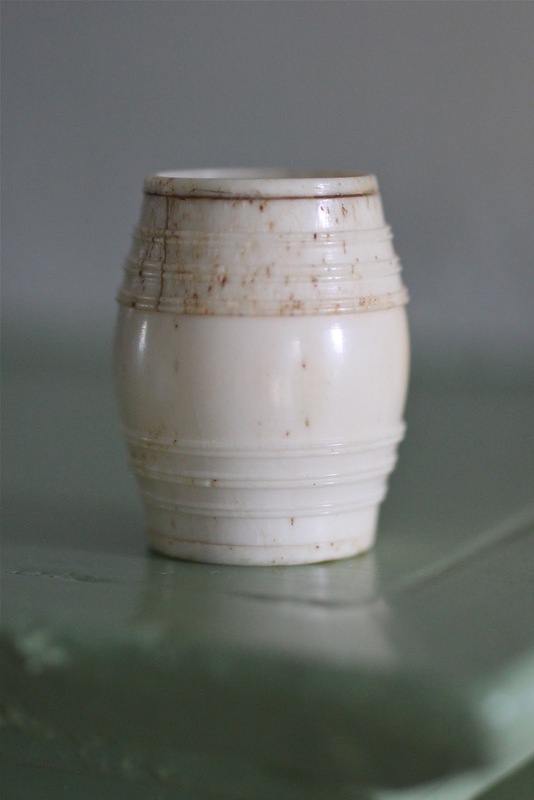 The lost lids would have been similar to the one seen on the modern jasperware urn shown in the above photograph. I hasten to add that Boy and the dealers were all well aware of this fact. 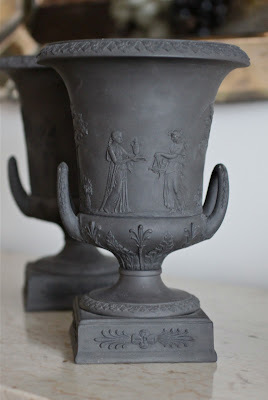 While it would have been awfully nice to have the lids for our urns, I suspect that we would likely not have been willing to front the necessary funds to acquire them, as the presence of such lids would have supported a selling price much higher than Boy ultimately paid. I have a great fondness for black basalt, Dear Reader, and have collected it for more than thirty years. I love the severity and vigor of it. 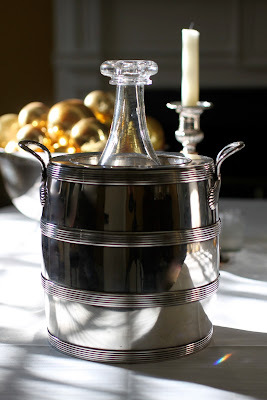 Our "new" basalt urns are a marvelous addition to our collection, I believe, and will be appropriately pride-of-placed on the chimneypiece in our dining room at Darlington House, where they will stand between the gilt bronze and crystal girandoles I wrote of recently. Bravo, Boy, for finding them! in the hearts of his countrymen"
Also at the downtown Armory show, Boy found this diminutive (it measures only 4½ inches high by 5¼ inches wide) framed print of George Washington at the booth of Andrew Spindler Antiques of Essex, Massachusetts. 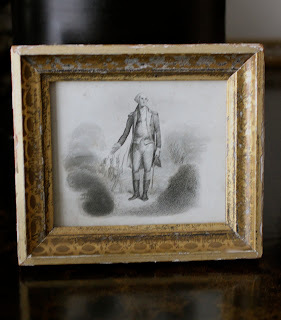 As readers of this blog may know, we have a collection of Washingtoniana at Darlington House, where this pleasing little image of the Father of Our Country, probably dating to the Centennial era, will be a delightful addition. It was very attractively priced and is what both Boy and I agreed was a "no-brainer" when our criteria for buying during Antiques Week were applied. 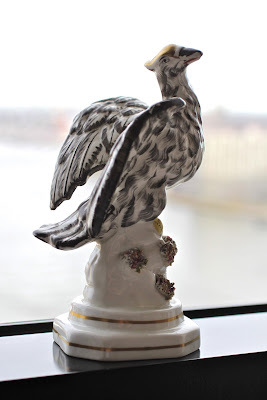 This year we came away empty-handed at the New York Ceramics Fair and the Metropolitan Show (a new incarnation of what had been known as The American Antiques Show until this year), both of which have been fertile hunting grounds for us in the past. 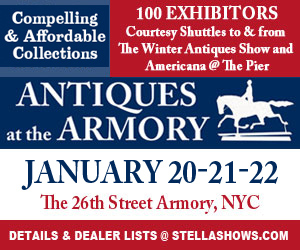 So far we've not attended the Winter Antiques Show, the Granddaddy of Them All, but I suspect we shall roam its aisles one night after work this coming week, as it continues its run through January 29th. On Saturday, at the Americana & Antiques at the Pier show, we captured this porcelain figure of a white leopard at the booth of J. E. Rider Antiques, who—like Andrew Spindler—also hails from Essex, Massachusetts. We had to buy the leopard because it is virtually identical, save for the painting of its coat, to a figure we already own that is painted as a tawny-coated lioness, and which is shown—albeit blurrily—in the background of a photograph in an earlier post. Just as was the case of the two early-nineteenth-century classical figures I wrote about recently, the leopard and the lioness could even have come out of the same mold, but are painted to resemble different cats. 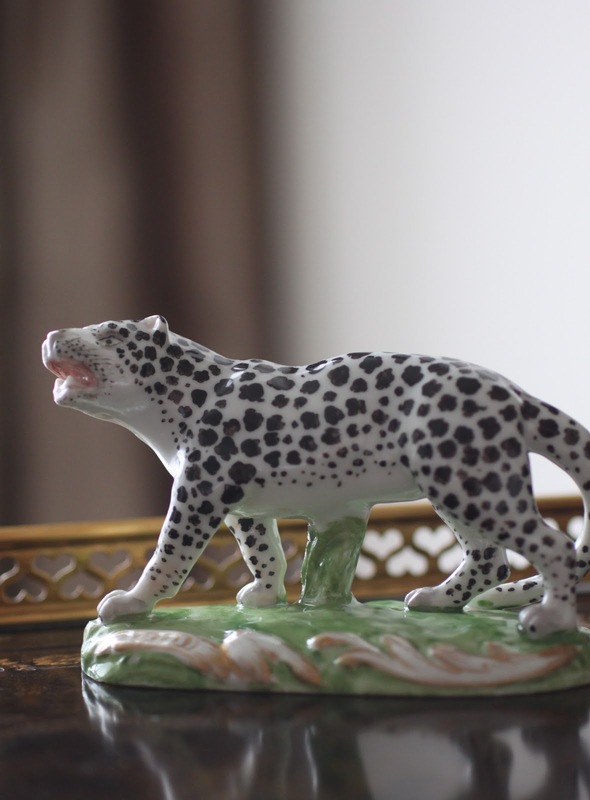 Mr. Rider said that he believed the leopard was made in the nineteenth century, likely in France, in imitation of an earlier Meissen figure. In looking the piece over I would agree with him that it was most likely made in the nineteenth century, but I have difficulty dating when, as such pieces were in constant production—in one form or another—from the eighteenth century up through the first half of the twentieth century, both on the Continent and in England. 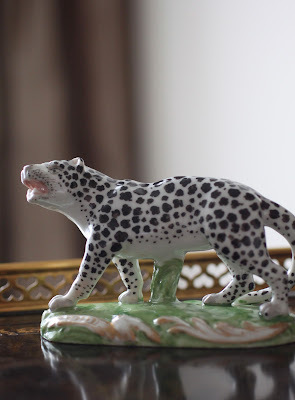 In the end I agreed to buy the little leopard (it measures only 4 inches long by 2¾ inches tall) because I liked it, which is the most important consideration for me when it comes to such matters. I plan on doing a future post in which I compare and contrast our "new" leopard with the lioness already in our collection. After leaving the Pier show we celebrated our Antiques Week success of acquiring three "must haves"—without having lost our heads, unlike in previous years—by having a delicious and leisurely lunch of oysters, salmon burgers, and Sancerre at Orsay. 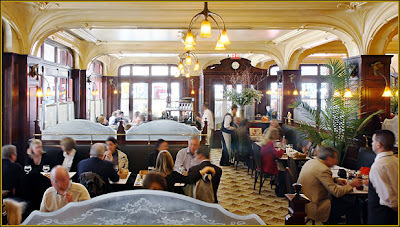 A favorite brasserie of ours, on upper Lexington Avenue, Orsay occupies the former site of the fabled Mortimer's that I wrote about a year ago in my review of Swifty's, also another great favorite restaurant of ours on the UES of Manhattan. And so, Dear Reader, another year of New York's Antiques Week has come and gone for those of us (Pompey included, of course) fortunate to call Darlington House home. 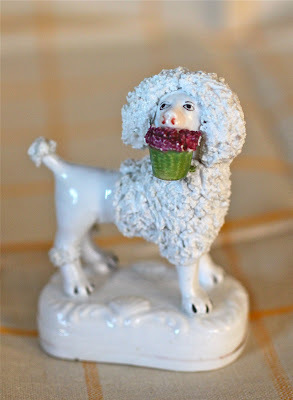 I've never really been a fan of Staffordshire poodle figures. Not much of one for spaniel figures, either. 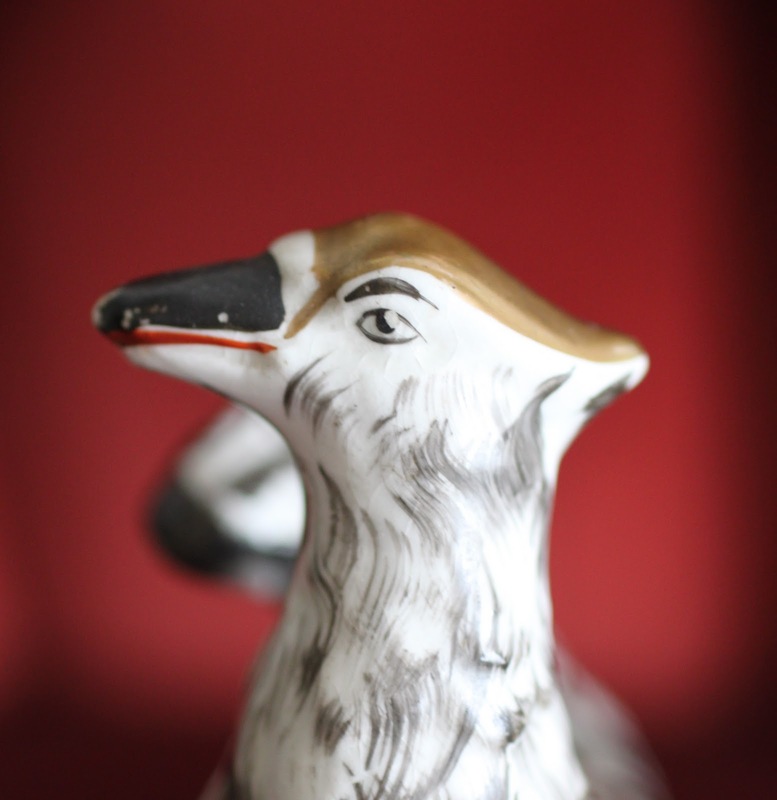 I do have two Staffordshire hound figures that I like. And, of course, we do collect figures of pugs, since we do so love and adore our darling little Pompey. The other day, when out and about shopping in the nearby town to Darlington, Boy came across a diminutive Staffordshire figure of a very coiffed poodle carrying a green basket of violets in its mouth. Despite Boy's best intentions, he fell in love with it. "I can't believe I like this little poodle, as I usually can't stand this sort of thing. But I must have it!" he said, looking at me to confirm whether I agreed with him or thought he had lost his mind. And I did agree with him—it was charming—and I said that I thought it would be a delightful addition to our collection of Staffordshire figures at Darlington House. 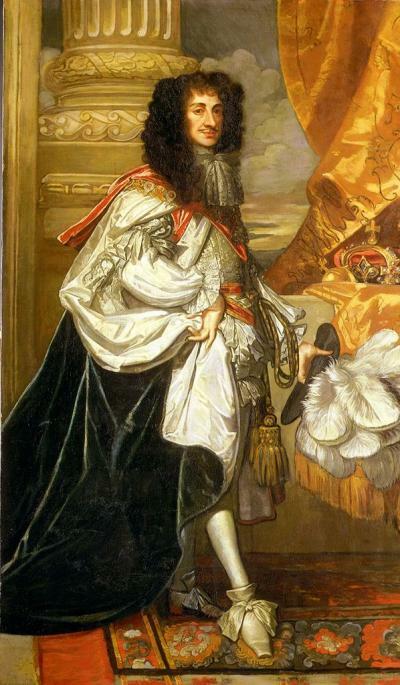 We date the figure to the 1850s because—among other reasons—the cut of the poodle's coat is in a style popular at the time, inspired by the wigs worn during the reign of Charles II of England. Also, the Roccoco Revival molding around the figure's base led us to conclude it was made in the mid-1800s rather than later. 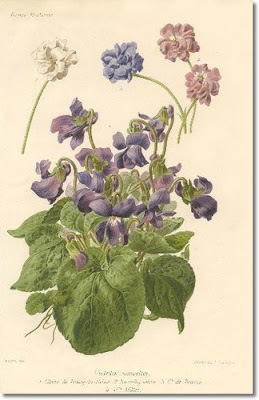 References to violets as symbols of rebirth and love have appeared in verse dating back to the ancient East and to the Classical world and have persisted in art and song ever since. One of my favorite popular references to violets is "Violets for Your Furs," a hit song popularized by Frank Sinatra in the early 1950s. 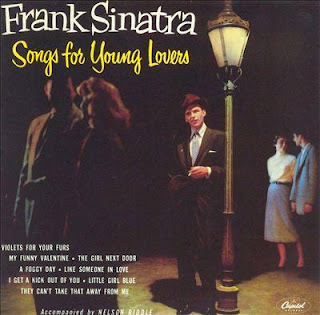 It was indelibly etched on my childhood brain by my father, who played the LP album upon which it appeared, Songs for Young Lovers, often enough that its grooves practically wore out. According to the American Violet Society, violets are "symbolic of the awakening year, earth's renewal, hope, and the simple joys and sorrows of love." Carried in the basket by the adorable little poodle that Boy had to have, they are a fitting and welcome offering at Darlington House this bitterly cold January long weekend. The snow drifted down on the flowers, and melted where it lay. The snow looked like dew on the blossoms as on a summer's day. This Christmas Boy gave me the present of a miniature screw-top barrel, only an inch and a quarter tall, carved from whalebone by a sailor in the mid-nineteenth century. Boy bought it (as I learned) from Angus Wilkie at his elegant antiques shop, Cove Landing, on Lexington Avenue. I suspect the vessel was originally made to hold snuff. I was absolutely charmed when I opened the package and found the tiny barrel in it. I love it. And it got me thinking . . . I have always been drawn to barrel-shape objects, and I have collected a number of them over the years. I'm not alone in having an affinity for barrels, either. There was a mad nostalgic vogue for them in the first half of the twentieth century, when all sorts of barrel-shape objects were made out of glass, ceramic, silver, and other materials. Here is an early twentieth century silvered glass barrel-shape ornament in our collection, hanging on this year's Christmas tree. We found it in an antiques group shoppe a number of years ago. 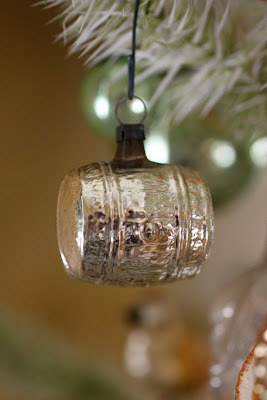 Over the years we've collected vintage glass barrels in various sizes to hold Pompey's kibble, biscuits, and treats. We've found them in group shoppes, at yard sales, and in junk shops. Most of them were made by the Anchor Hocking Company in the 1930s and 1940s. 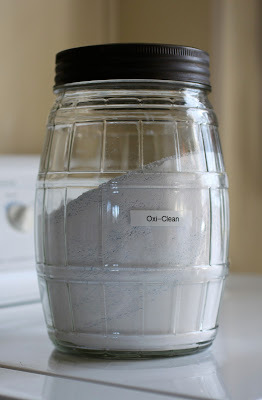 We use a vintage glass barrel in our laundry room to decant powder. It is a much more attractive alternative to the powder's original and rather ugly packaging. 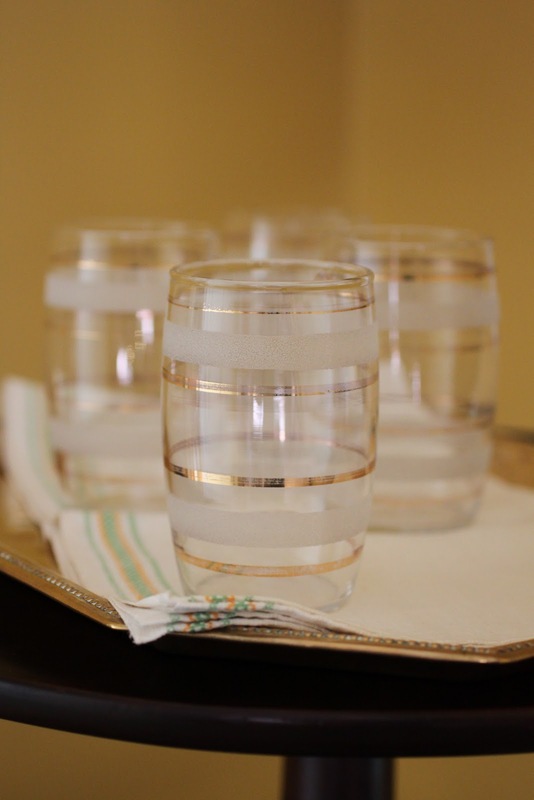 In the mid-twentieth century American glass manufacturers, such as Libby and Corning, produced drinking glasses in the form. 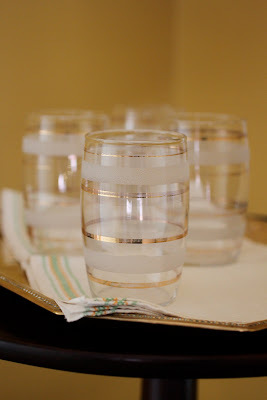 We have a set—a great favorite of mine—decorated with bands of sanded white and gold, that we use for summer cocktails on the screened porch. 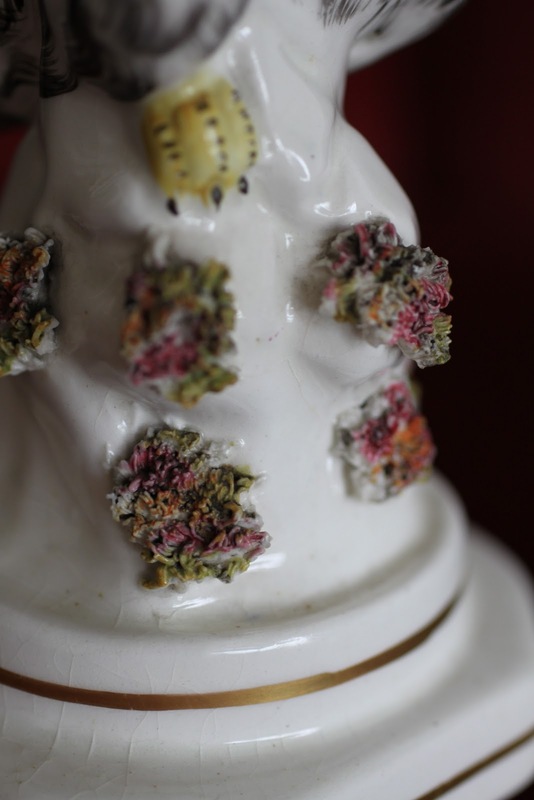 We found them in a long-closed group shoppe in Great Barrington, Massachusetts, a dozen or so years ago. Ratcheting it up a few notches, I leave you with an image of a smart old Sheffield silver wine cooler, dating from the first quarter of the nineteenth century, that we bought last spring from Spencer Marks, Ltd. at an antiques show at the Park Avenue Armory.